Since enrolling at the University of Sydney, Ph.D. candidate Amanda Thran has embraced Australian culture, which included making friends with this kangaroo. A devotion to the ocean has led a Jamestown woman from the smallest state to the smallest continent. In layman’s terms, Thran’s research showed how deep ocean currents move contourite drifts, which are anomalously high amounts of underwater sediment. Professor Adriana Dutkiewicz, a sedimentologist at Sydney, announced the award in mid-June. The achievement is given to a Ph.D. candidate from each of the science majors; Thran was the recipient for geosciences. “The amount of work undertaken for this project and its impact on the research field cannot be underestimated,” Dutkiewicz wrote. Her 6,000-word paper was published in a May issue of Earth and Planetary Letters, a weekly scientific journal reviewed by peers. There also is an interactive model at the GPlates Cesium website. The decision to study contourite drifts began with a supervisor’s suggestion. Thran then observed a model of ocean circulation, which led her to a glaring question: Is there a relationship between the positions of strong underwater currents and where contourite drifts are found in the ocean? “Due to the lack of a comprehensive contourite database, the link between vigorous bottom water activity and drift occurrence has yet to be demonstrated on a global scale,” she writes in her abstract. Thran said the formation of these contourite drifts are similar to snow accumulating into drifts during the winter. “The exact same thing happens on the sea floor, but instead of snow, you have sediments, and instead of wind, you have bottom currents,” she said. Thran began researching in August 2016, and completed the paper in March. Less than two months later, it was published. She also made a presentation to her professors. During the course of her research, Thran created the first-ever database of contourite drifts, which she described as a meticulous process. Because she spent hours every day combing through research papers and images of the ocean floor, Thran was even prescribed eyeglasses. Ultimately, Thran and her team discovered bottom currents generally do not move quickly over the course of a year. Also, they are not fast enough to constantly lift sediment from the seafloor to form these contourite piles through their speed alone. Previously, it was thought that these underwater currents constantly moved briskly, which caused the gradual movement of sediment. These movements are not always slow, Thran’s team also discovered. The speed of the currents varied around certain underwater features, which led to occasional episodes in which they became particularly energetic. Her leading theory is that these intense periods were the only times in which the currents were moving quickly enough to rearrange and dump sediment found in the drifts. According to the judges, these findings are particularly important to paleoclimatologists, who study the history of climate change on Earth. That’s because contourite deposits are useful for determining erosion and sedimentation records. “The work will not only inform future ocean drilling expeditions, but will influence how the sedimentological contourite record is interpreted in terms of climatic and oceanographic changes,” Dutkiewicz said. During their research, Thran and her team tried to locate previously undiscovered contourites. They hope their findings are utilized by scientists who can confirm these locations during ocean expeditions. The contourite drifts that Thran has been studying are found only in specific spots on the seafloor, particularly the western side of the ocean basin. One of these areas is near Greenland and Iceland, where currents in the North Atlantic are formed by surface water that sinks to the ocean floor. This means some of these contourites can be found in the same part of the ocean that Thran spent most of her life living near before she moved to Australia. Thran grew up in Virginia Beach and moved to Jamestown when she was 9 years old. She attended Melrose School before transferring to St. Michael’s Country Day School in Newport for middle school. She then attended high school at Phillips Academy Andover in Massachusetts, graduating in 2011. When deciding on a college, Thran knew she wanted to leave the country. 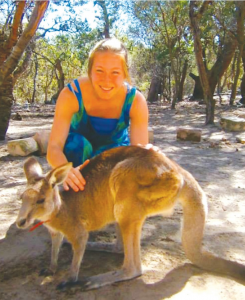 She selected the University of Sydney because of her curiosity Down Under. As an undergrad, Thran majored in marine science, stemming from her lifelong fascination with the ocean. As a teenager, she took diving and sailing lessons to learn about the ocean firsthand. She earned her bachelor’s degree in 2015. “I was always drawn to the sciences in school,” she said. While attending school, Thran has lived in the Alexandria section of Sydney, about 3 miles south of the city’s harbor. Moving from Jamestown to Sydney wasn’t much of a culture shock, she said, aside from the larger size and warmer temperatures. Another major difference has been the 14-hour difference in time between the east coast of Australia and the East Coast of the United States. Thran said her friends and family know that the early evening in the best time to contact her, which would be the morning of the next day for her. Thran visits her parents about once a year, but she keeps a memento of her hometown close by: A photograph of the Newport Pell Bridge is the desktop wallpaper on her computer.